Spring Clean Tarot Spread | Get Your FREE Reading Here Today! Spring is a time for renewal and beginnings. However, there is no need to wait for the start of Spring to reinvent yourself. We reinvent ourselves in many ways; new hobbies, new clothes, new hairstyles, a new job or house, a new circle of friends or a new way of thinking or lifestyle choice. We change every day in small amounts and sometimes change isn’t for the best. Lots of us wait until the first day of the week, the first day of a month, but it doesn’t matter, if you wanted to, you could start now. This spring clean tarot spread should help you find out what changes you should look for and where you should find them. This is a simple spread. Shuffle your deck and take a moment to prepare yourself. Start by placing one card on its side. This card represents some aspect of your life that you should strongly consider removing. To aid this; place three cards on top of it. These three cards should give you inspiration for new directions in life; the leftmost is a short term change, the middle is a long term change, and then, the rightmost is a lifetime goal. Think about the cards for a few days as the answers may not seem obvious at all at first. Get your FREE Spring Clean Tarot Reading with us today. 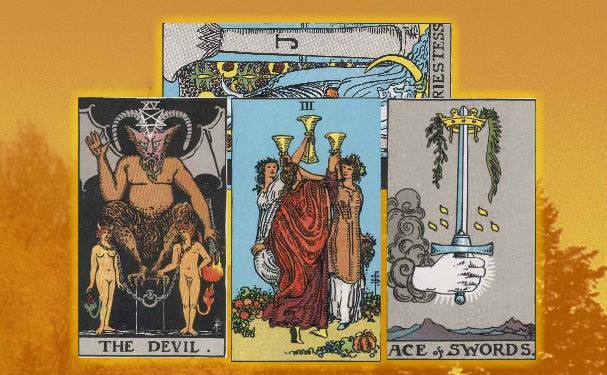 We’ve selected live tarot readers to give you a FREE 3 Minute Spring Clean Tarot Reading! Scroll through them below and pick your favorite one. How was your Free Spring CleanTarot Reading? Let us know in the comments below!